Dashboard Template is a pre-designed dashboard added to an account. Dashboard Template Library – The collection of Quickstart Dashboards that are available to an end user. Dashboard Template Designer – The ability to add new dashboard templates to the Library. The first tier is Slemma. The Slemma team provides 25 dashboard templates spread across the following 10 connectors: Infusionsoft, Salesforce, Pipedrive, Hubspot, Insightly, BaseCRM, Google Analytics, Google Adwords, QuickBooks, and Zendesk. These templates are available for all users on any Slemma plan. Team admins can unable/disable the templates for their team on a page Admin>Dashboard template designer. The second tier is Team level. Team Owner and Admin can add dashboard templates to allow all team members to use these pre-built dashboards. The third tier is Group level. Team Member Group Admins and Client Group Admins are able to add dashboard templates. Only users in their group can use these pre-built templates. 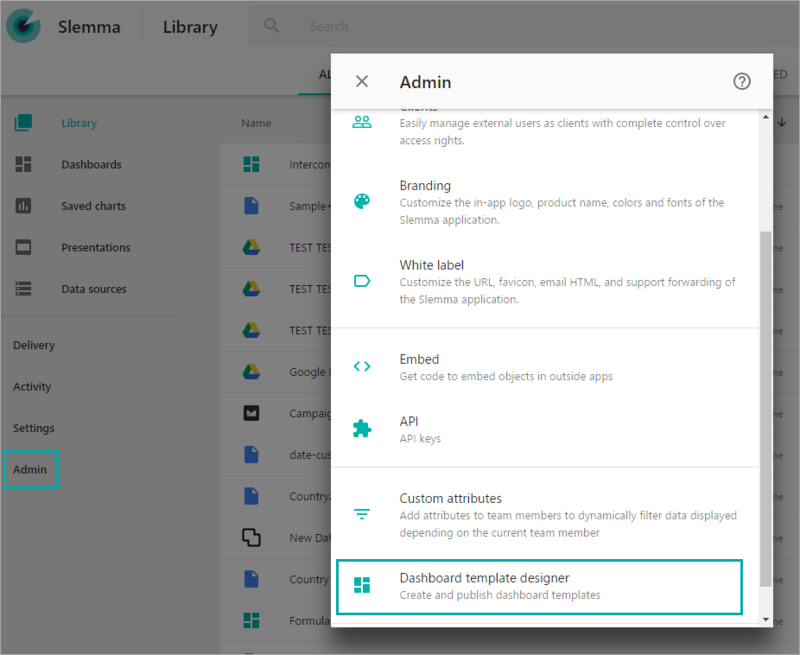 Team owner and admins can add their own dashboard templates to the template library. To do this, select the Admin section from the Navigation page and open Dashboard Template Designer section. Click plus button at the bottom of the window. You’ll see the list of dashboards created by you or shared with you. Select one of them – it will be saved as a template (the original dashboard won’t be changed). Note that dashboard template shouldn’t contain saved charts, or charts built on local files and files from Cloud storage. Dashboard Templates work for databases and cloud service integrations only. You can remove the template from the list or add a preview picture by clicking a trhee-dots button near the template name.